Standing in front of a food cart in a small city in France, Kathy Rosenthal dug deep into the beginner French she was learning at the time. Rosenthal chuckles at the memory. Now a fourth-year French language student, and president of the Laurier French Club, Rosenthal teaches French grammar to fellow students. Her days of fumbling with French are long gone. But she remembers how tough it can be for beginners. Spending a summer in a small Quebec town was a turning point for her. 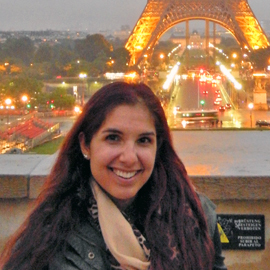 As part of a 5-week French immersion course, Rosenthal lived with a family. As she struggled to speak only French, family members corrected her. Teachers corrected her. Waiters and waitresses (you guessed it) corrected her. Then one day after leaving a local café it dawned on Rosenthal that, for the first time, the waitress who took her order didn’t correct her. Rosenthal’s experience isn’t unusual, said Hugo De Marinis, chair of Laurier’s Department of Languages and Literatures. Many students go from being tentative to talkative. Many can read and write a second language, but speaking is difficult for them, he said. But after an immersion, that wall crumbles. It’s not just a common experience for students of French. Laurier’s Languages and Literatures department offers bachelor’s programs majoring in French or Spanish. It also runs a unique program in Ontario: a Bachelor of Arts in Languages consisting of in-depth studies of French and Spanish, plus studies giving students basic knowledge of a third language — Arabic, German or Italian. And there are lots of opportunities for learning outside of the classroom. After her first year Rosenthal and about 30 other students took a 5-week language course, led by a Laurier professor, in Spain. After her second year she went on the Quebec immersion. And after third year she returned to France for an 8-month exchange program where she no longer needed to point at the cheese sandwich she wanted for lunch. While Rosenthal says she was partly attracted to Laurier because of its relatively small size, De Marinis says one of the strengths of the Languages and Literatures department is its teaching. While Rosenthal wants to eventually teach French as a career, learning another language doesn’t only lead to jobs in teaching, De Marinis said. Graduates have landed work with import-export businesses and with firms that have offices and clients overseas. Other grads have joined the non-profit and public sectors, working in international relations and diplomatic missions abroad.